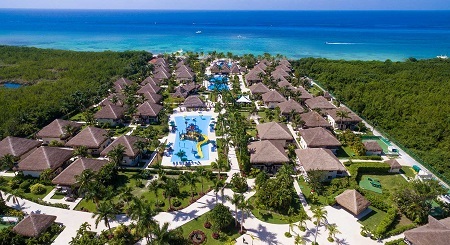 All Inclusive Allegro Cozumel Resort in Cozumel, Mexico! Bid Per Person Per Night & Choose Your Length of Stay! 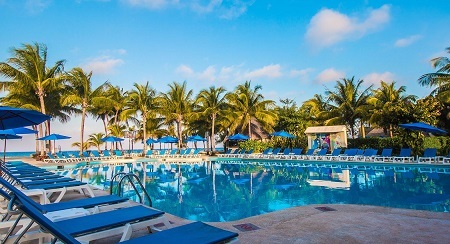 The 4-star Allegro Cozumel Resort**** has been designed to offer sophisticated accommodation on the magnificent Playa San Francisco, one of the world's most beautiful beaches on the island of Cozumel. At this resort, guests can find the perfect balance during their vacation. 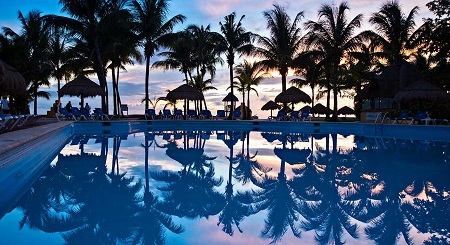 Swimming with dolphins and sea turtles in the sea, lying on the beach in the sand or jumping into one of the 4 swimming pools at the resort. Relaxing in soothing places such as the jacuzzi or sauna or being active in places like the water park or the resort's sports facilities. With spacious rooms decorated elegantly with tropical motifs and varied food options available at 5 restaurants, after so much physical activity guests will consider it a true pleasure to regain their strength at the resort. 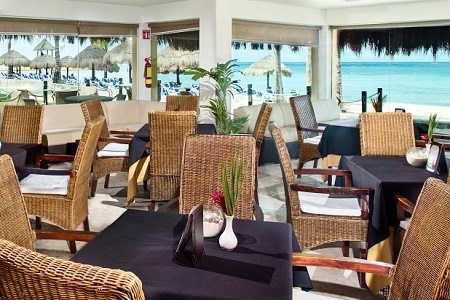 At the Allegro Cozumel the all-inclusive plan offers unlimited meals and beverages at any of its 5 restaurants and 5 bars, where guests can enjoy delicious and varied cuisine in the most pleasant atmospheres. 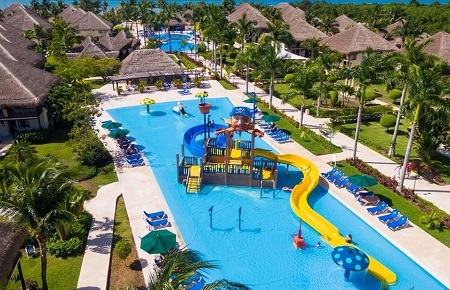 The Allegro Cozumel Resort invites guests to stay in one of its nearly 300 rooms to experience an incredible vacation filled with activities in the middle of nature. Staying in one of our comfortable bungalows, with thatched roofs and tropical decorations, will make our guests disconnect from their daily routine and become fully immersed in the natural paradise found on the island of Cozumel. Featured Services: 24-hour front desk, luggage storage service, babysitting service (available by request for an additional charge), minibar and free parking at the hotel. Offer is based on a Double Occupancy in a Superior Room. These 312 ft² rooms come equipped with 1 king bed or 2 queen beds. They all have a balcony with a hammock so that you can relax and contemplate the beautiful scenery. Maximum capacity: 4 people (possible combinations: 3 adults; 2 adults and 2 children; or 3 adults and 1 child). Upgrade to Superior Room Premium for an additional + $15 per person per night. The 314.2 ft² Superior Premium rooms provide a comfortable stay full of amenities for your enjoyment. They offer easy access to the pool and hot tub area. You must request cribs and extra beds at the time of booking. Maximum capacity: 3 adults and 1 child; or 2 adults and 2 children. The resort offers excellent packages for scuba diving experiences at one of the world's top destinations for scuba divers. Upgrade to Premium Room with Ultimate Dive Experience for up to 3 Divers. Superior Premium Ultimate Dive Experience (UDE) rooms feature all the services of Superior Premium rooms and so much more – all geared towards the dive vacationer. There are many perks when booking a UDE room.They include;premium location of the room – close to the beach, private and personalized check in /out, special bracelet, exclusive pool area and private Santa Rosa Oceanfront Lounge for dive vacationers. Also furthermore offers one tank per day for diving for up to 3 divers, complimentary storing and care of the equipment at the dive shop, and special drying rack in the room for wet suits. Maximum occupancy: 3 Adults + 1 child or 2 Adults + 2 children. TERMS & CONDITIONS: The Ultimate Dive Experience is subject to availability at time of booking and may be changed, discontinued or withdrawn at any time without prior notice. Exceptions, blackout dates, cancellations & other restrictions may apply. Not responsible for errors or omissions. Guests must be PADI® certified or equivalent. Non-divers will need to complete onsite dive training. Dive tanks are personal, non-transferable and non-cumulative. Limited to 1 tank per day per person. Rental gear and Marine Park fees not included. Children under the age of 2 years are always FREE when sharing same room with 2 adults. Children rates are based on travel dates - as low as $15* per child per night — See details under "options" below. Children Rates will only apply when sharing room with 2 adults, when sharing with 1 adult the first child will pay as the second adult for double occupancy and the child rate will apply to the 2nd child. Please submit children's names and dates of birth with your travel information. Stay a minimum of 3 night or up to 14 nights as desired and based on availability. Single Supplement: Offer is based on double occupancy, single supplement of +$125 per night is available for those traveling or rooming solo. Single parent staying with children must pay the Single Supplement and Child rate. Tax and service charges of $59.oo per adult per night are additional. All Reservations must be requested by noon est. on July 31, 2018!